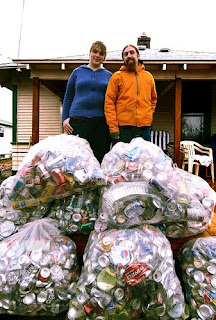 IN his continuing search for the more weird, whacky and wondrous in the world of travel, David Ellis says a couple in Spokane in America's Washington State are paying for their wedding and a 3-day honeymoon with 400,000 discarded aluminium beer and soft drink cans. Calling themselves just Pete and Andrea, they've collected over 35,000 cans themselves in their first month – and had relatives, friends, workmates, and as a result of local Media coverage, complete strangers give them a further 75,000 that they've sold to a scrap dealer. "It leaves us 290,000 cans and seven months to reach our goal of 400,000 cans to pay for our July 31 wedding," Andrea said. To further cut costs they've got family and friends making floral decorations, taking the wedding pictures… even helping with the wedding breakfast and the bridal cake. 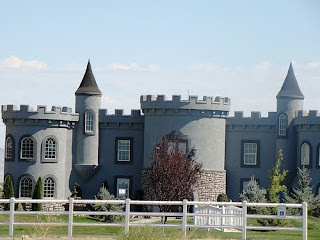 And in keeping with the atmosphere of it all, the outdoor wedding, the reception, the morning-after breakfast and a 3-day "honeymoon" will all be held in a somewhat off-beat replica Bavarian castle in neighbouring Idaho State that's called The Idaho Castle. "It's a vacation home and we're getting it for four days for what you'd normally pay most reception halls for just four hours, so that's another saving," said Andrea, who says they hope to keep the cost of the wedding, reception, honeymoon and everything else associated with it to under US$4000.